Using new lifestyle craft dies I created this card. The dies were much bigger than I thought they would be so my card is pretty large. LOL Whimsie Doodles put out some new images of Koale and Leah that I just love. Koale's little bathing suit is just adorable with the little fish on it. 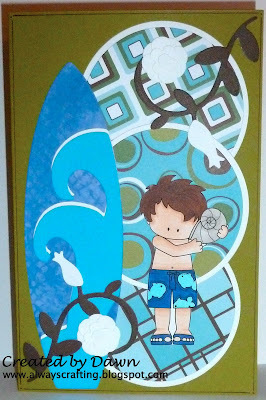 I am so excited this card won the Whimsie Doodles Challenge "Beach Themed Cards"! Ps. the dies are fab!! ds. What a wonderful card you've made Dawn!I love it! Thanks for joining in the fun at Dream Valley this time. Ooops back again, didn't spot that you also entered at Lexi's! These colors make me want to jump in the pool! Thanks for joining us at Dream Valley! Very Cute!!!!! Love the use of the surf board. Adorable!!!! Daisy Doodles appreciates your joining the summer Fun challenge. Wau eine wundervolle Karte einfach genial.